I could go on and on about how much I love having pre-roasted ingredients on hand for assembling meals and snacks, but I'll get right to the point: paired with a handful of store bought ingredients, roasted vegetables and fruit make perfect toppings for a seemingly endless variety of crostini that can be assembled in five minutes flat. So the next time you're in need of a little lunch, a snack or even an appetizer for a gathering, these little toasts are just the thing. Below are a few of my recent favorites. Please ignore the color (and other) problems with the photos, and have a happy weekend! 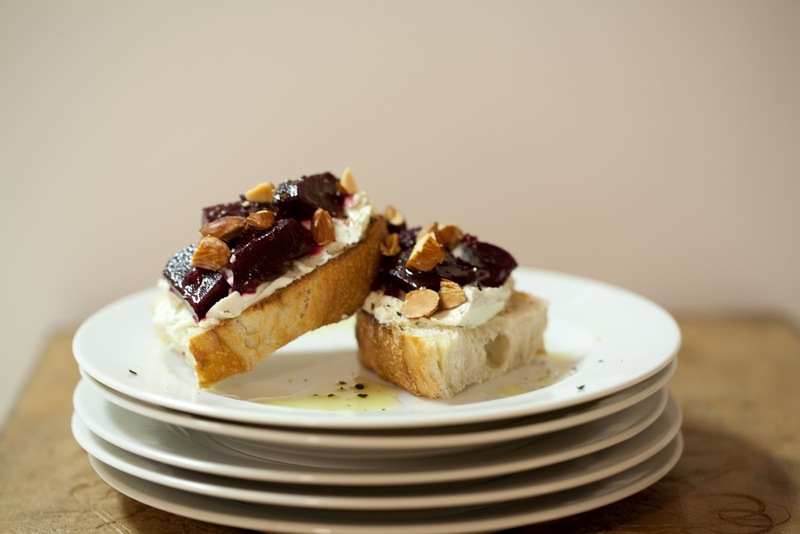 Chunks of roasted red beets are marinated in champagne shallot walnut vinaigrette and spooned onto toasted ciabatta bread that's been slathered with herbed chèvre. Finish with chopped toasted almonds, a drizzle of olive oil, and salt and pepper. To make the beets: Scrub and dry whole red beets, rub with olive oil and wrap in aluminum foil. Place on a baking sheet and roast in a 400 degree F oven for about 45 minutes, or until tender when pierced with a fork. When cool enough to handle but still warm, peel and chop the beets into chunks. Toss with vinaigrette of choice (I make my own or use Stonewell Kitchen's Champagne Shallot Walnut Dressing) and refrigerate for at least an hour. Remember those pears from the Roasted Pork Tenderloin with Pears and Leeks? 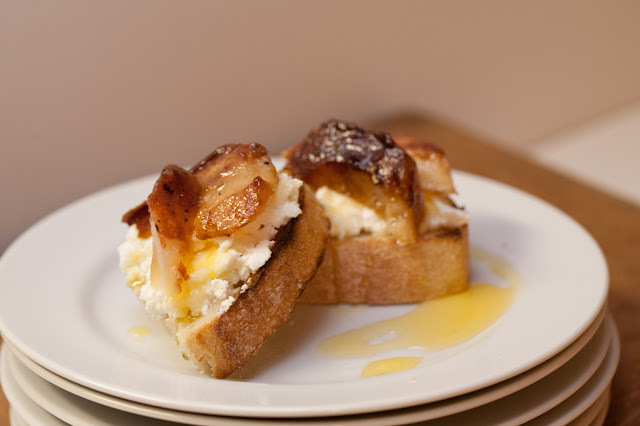 They're delicious atop ricotta on toasted ciabatta. Drizzle with Lyle's Golden Syrup (or agave or honey) and sprinkle with freshly ground black pepper for a punch of flavor. 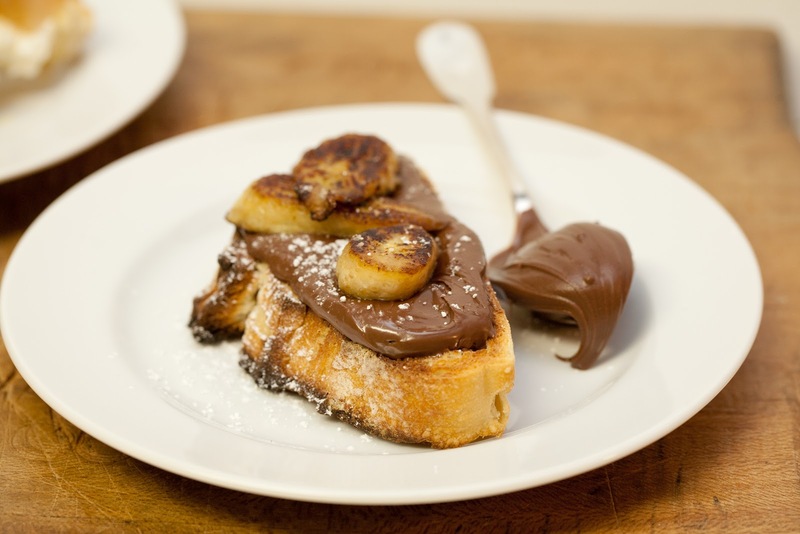 For a rustic, deconstructed twist on pain au chocolat, slather (yes, slather) Nutella (or your favorite chocolate and nut spread) on toasted ciabatta and top with sliced oven- or pan-roasted bananas. A sprinkle of powdered sugar and an extra spoonful of Nutella on the side make for a whimsical presentation.